"3LA1, V-188" by Timothy K. Perttula and Robert Z. Selden Jr. CONTEXT INFORMATION: From a grave, 1924. DECORATION: The short rim has a single raised or collared ridge with a row of tool punctates on it. The body has four repeating sets of trailed concentric circles, with upper and lower triangular trailed elements separating each concentric circle motif. TYPE: Keno Trailed, var. unspecified, probably var. Scott’s Lake based on the vessel form and the punctated rim (cf. Schambach and Miller 1984:Figure 11-26a). Keno Trailed, var. 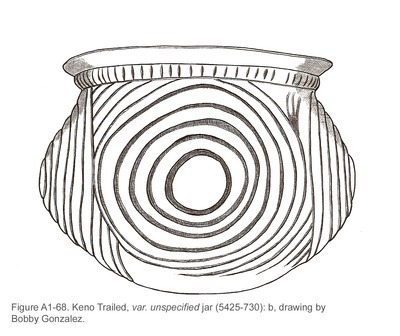 unspecified jar (5425-730): a, photograph; b, drawing by Bobby Gonzalez.